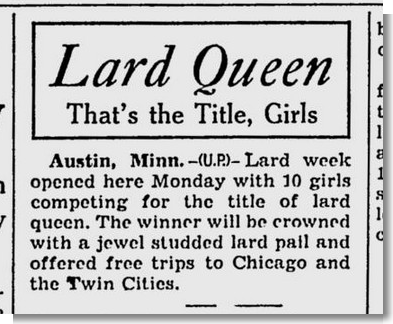 So what’s a lard pail, you ask? Curiously enough, it’s a pail that lard comes in. (I don’t know what you were expecting.) Most of us know that until the second half of the last century, lard was the fat of choice to fry chicken, make baked goods tender, or perform any other task you’d use shortening for today. 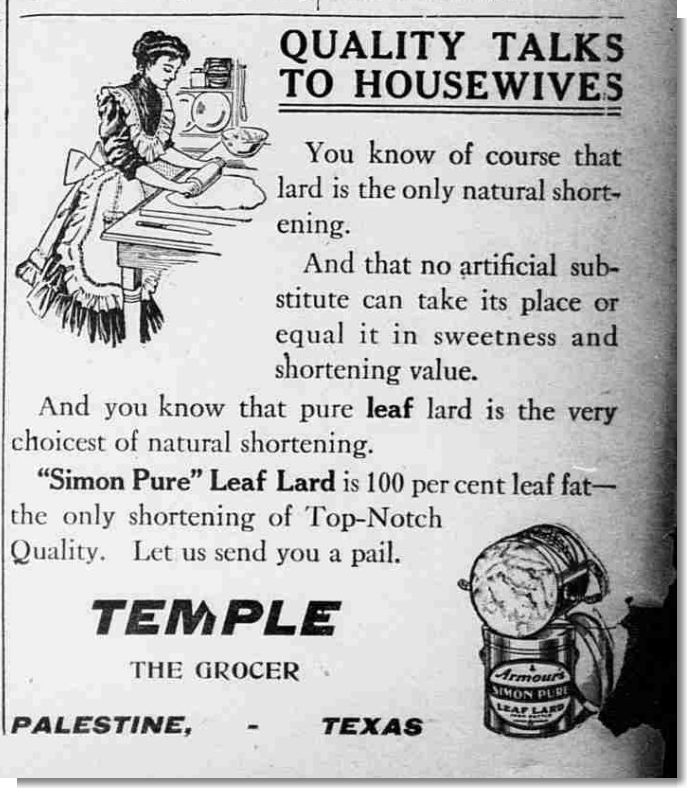 But we don’t always think about how lard was acquired in the average American household. To purchase lard, you’d go to the store and pick up metal, airtight bucket of shelf-stable rendered lard, a bit like a paint can, except the lip of the lid fit over the top edge of the bucket. The advertisement above, illustrating such a bucket, ran in the June 15, 1908 edition of the Palestine Daily Herald–105 years ago today. 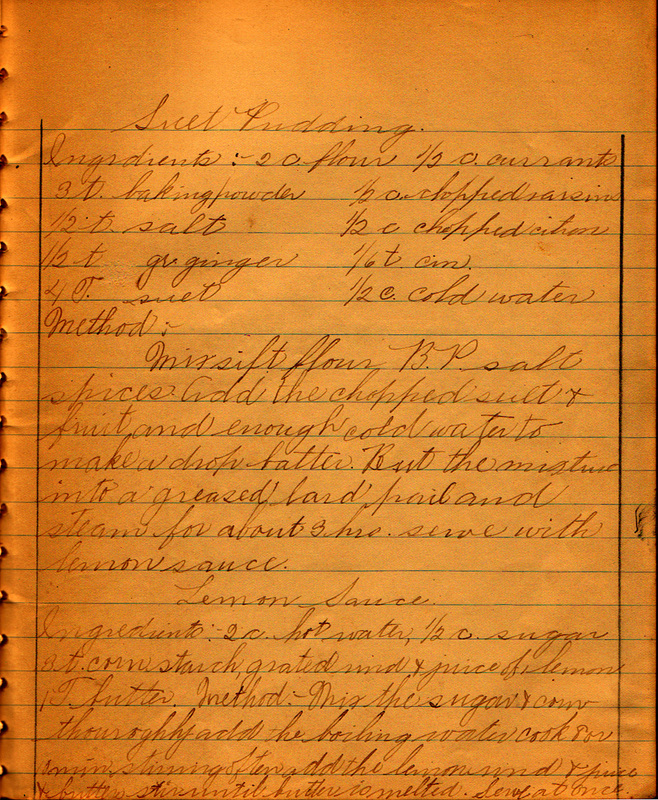 The pails were made of tin at the time this recipe was written in 1915; later, they’d be made of steel, tin-plated metals, and eventually, plastic. 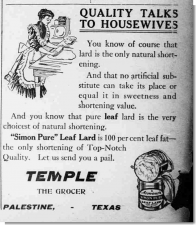 But the significance of lard pails in the early 20th century is entirely under-estimated. 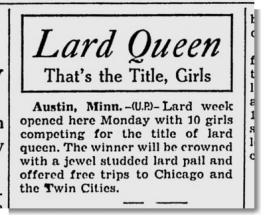 Lard pails had quite a few interesting features. They were air-tight, durable, heat resistant, rodent proof, and basically free with your purchase. They also were found in sizes generally ranging from two gallons to ten gallons or larger. 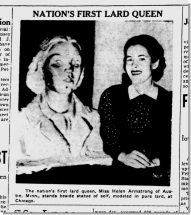 Mentions of lard pails in news stories of the day include children injured by falling in the larger ones to children using the smaller ones as lunch pails; guilty men using them to hide stolen objects and farmers using them to bury their life savings; high school teachers using them in science experiments and home bakers using them as baking vessels; and in these clips from the March 25, 1940 The Milwaukee Journal and the April 7, 1940 The (Dubuque, Iowa) Telegraph-Herald , to crown a queen. Still, my favorite mention of a lard pail is from the January 16, 1909 edition of The Deseret News, where a letter to the editor from a milkman who laments: The most abominable thing on earth used for containing milk is a lard pail, and there are more of these used than anything else. Which I guess just leaves the question: why would you cook a suet pudding in a lard pail? 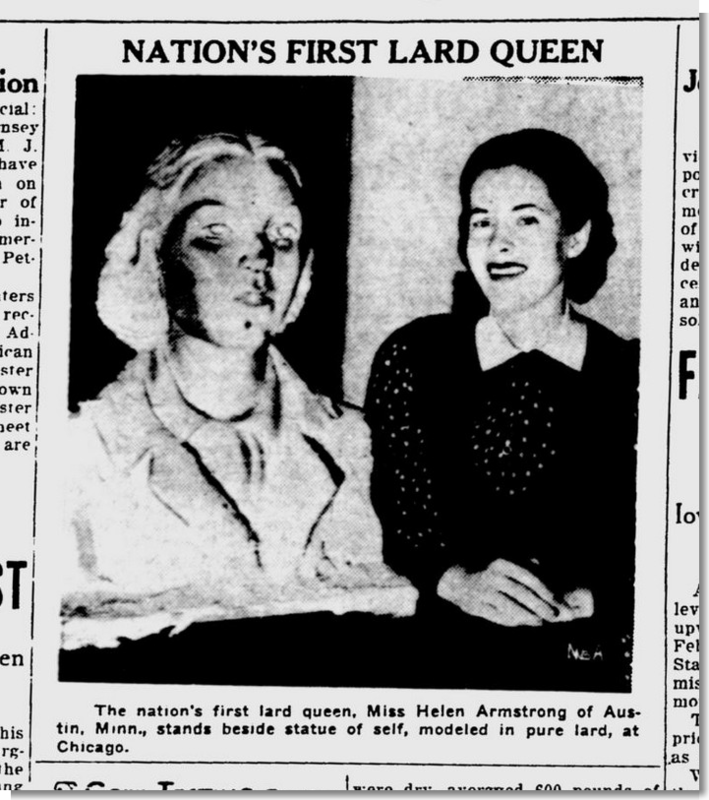 Well, remember our discussion about animal fats? While pork fat is called lard in both its raw and rendered states, beef fat is only called suet when it hasn’t been rendered. Since suet hasn’t been rendered, it would have to be sold at the butcher–although there were brands of tallow (rendered suet) mixed with hydrogenated cottonseed oil. But the shorter answer is that, once the pail was empty, everyone would’ve called it a lard pail, even if what came in it was a cottonseed-tallow blend. 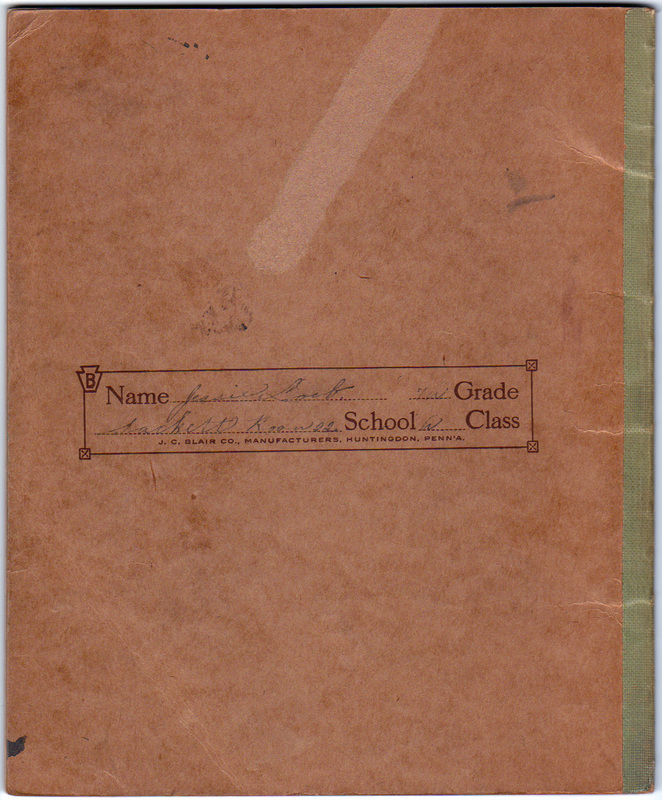 For a larger version of this scan, click here. 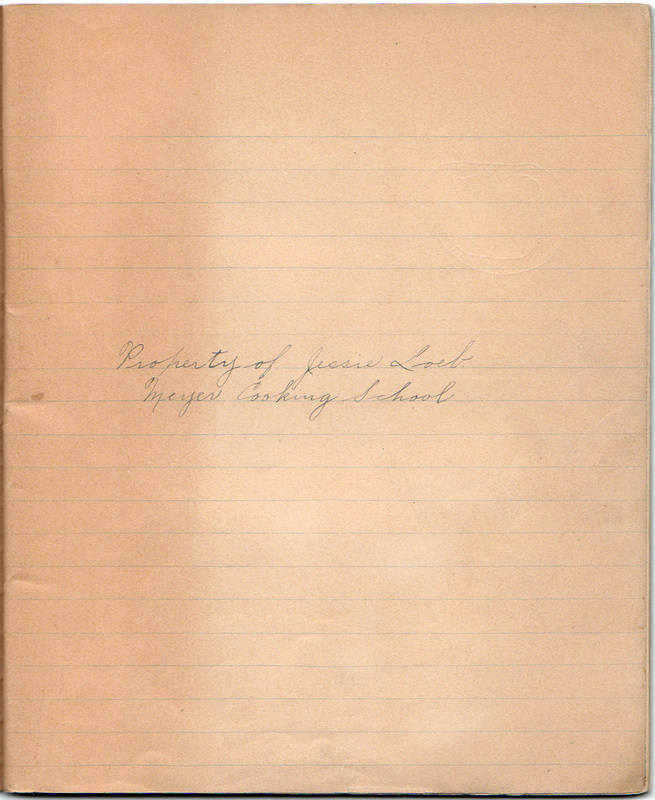 From the notebook of J.L. from Avon Lake, Ohio. 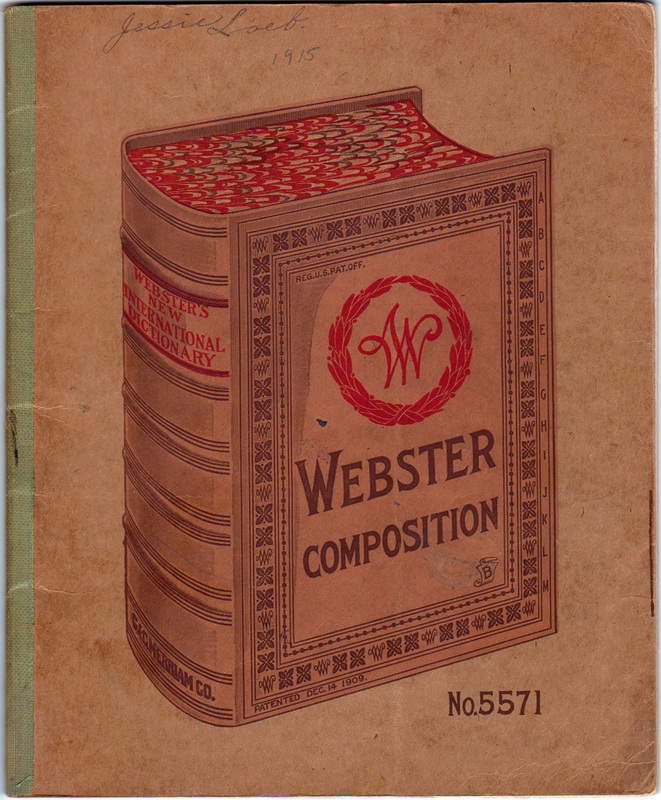 Dated 1915. Mix, sift flour, baking powder, salt, spices. Add the chopped suet and fruit and enough cold water to make a drop batter. Put the mixture into a greased lard pail and steam for about 3 hours. Serve with lemon sauce. Mix the sguar and cornstarch thoroughly; add the boiling water. Cook for 10 minutes, stirring often. Add the lemon rind and juice and butter. Stir until butter is melted. Serve at once. Guess which ingredient she forgot to include? Rice, milk, sugar, nutmeg and salt. Also, notice the nitpicking grading remarks at the end of this one.